Succulents are known as forgiving plants and are therefore a favorite of both new and established gardeners. Botanists describe these plants as having parts that are “more than normally thickened and fleshy,” which means they can retain water in their leaves or stems in arid conditions. But even though succulents can endure a little neglect, they can die if not cared for properly. If you want your plants to flourish, you need to give them a little tender loving care. 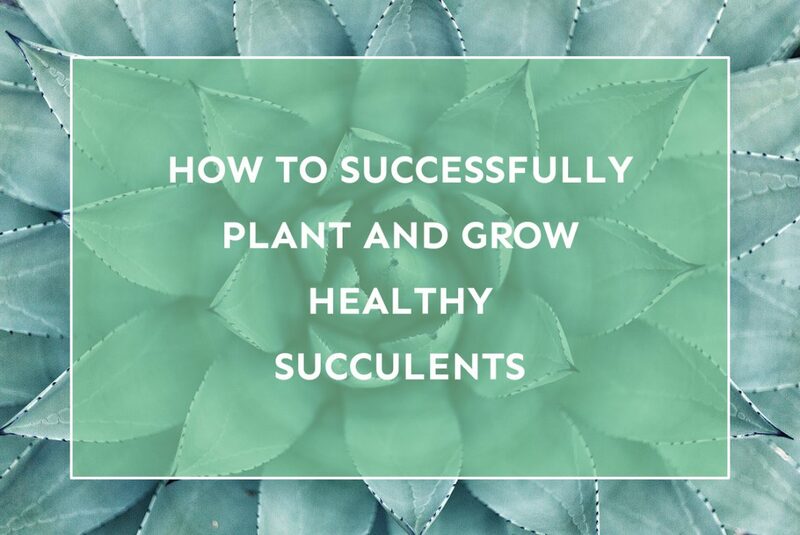 Follow this guide to plant and grow healthy succulents successfully. Select your plant. If you are planting outdoors, feel free to choose plants that flourish in direct sunlight. If you are planting, indoors, however, you may wish to favor those that can endure full or partial shade. According to the Succulents and Sunshine blog, in general, brightly colored succulents (with oranges, reds, and purples) don’t do as well indoors because they require more sunlight than they tend to get inside a house. Green succulents have a better chance of flourishing inside. Choose a container. Pick a pot, bowl, trough, or another planter to house your succulent. Make sure your container has drainage holes. An excess of moisture might result in the roots of your plant rotting. If you are planting outdoors, well-drained soil is a must. Avoid areas that collect standing water. Fill your container with potting mix. Either mix about twenty-five percent sand with seventy-five percent soil to create a succulent-friendly potting mix, or purchase a mix specially designed for succulents. A quick-draining potting mix is preferred, which is why many gardeners mix sand with soil. This soil should not be too rich. Most succulents require fertilizing only a couple of times a year. Remove the plant you are potting from its nursery pot. To do this, you will need to turn it upside down and pull off the pot. Do not yank the succulent upright out of the nursery pot, as this may cause damage. Turning the pot upside down lets gravity assist with the removal. Plant your succulents. If you are planting several succulents in one container, plant the edges first. It is acceptable to plant succulents close together. Fill in the gaps. Once you plant your succulents, you’ll need to fill in any gaps between them. Add soil mix and push down lightly. Water. When you water your plant for the first time, aim for the soil, not the foliage of the plant. Remember that succulents retain water, so don’t overdo it. Once you’ve planted your succulent plants, you’ll need to concentrate on keeping them healthy. Three essential considerations when growing succulents are positioning, watering, and fertilizing. Some succulents can flourish even in the darkest corners of your house, while others will need partial or full sunlight. Be sure to check the light needs of your particular plant and position it accordingly. Set plants that require a lot of sunlight in windowsills. Plants that tolerate low light conditions and shrivel with too much direct sunlight, such as pearly dots, can be positioned in corners of your home. Poisonous plants should be put out of the reach of children and pets – either by placing them on high shelves or in hanging containers. Place fragile plants with easy-to-damage foliage in an area they won’t get bumped. Check the soil of your plant about seven days after your first watering, and, if it is dry, give it another one. If the soil is not dry, wait. When you do water, the water should spill out of the drainage holes located at the bottom of your pot. You can then empty the water that collects in the dish beneath your pot. The soil should dry out entirely between waterings. Overwatering can result in damage, so be careful not to overdo it. Your succulent will need the most water in the early spring and the least in winter when it is likely to be dormant. Dilute your balanced, soluble fertilizer (8-8-8 or 10-10-10) in water to one-half strength or one-fourth strength for tropical succulents. Water your plants with the fertilizer solution. Fertilize in early spring and late summer or early fall. Do not fertilize during the semi-dormant winter phase. If you follow these tips and tricks for planting and growing healthy succulents, you’ll be well on your way to having a beautiful, natural addition to your home or garden.